Continuing our new series of collaborations with political science journals, we are pleased to present the following guest post from Georgetown University political scientist Keir A. Lieber and Dartmouth College political scientist Daryl G. Press to discuss their article “Why States Won’t Give Nuclear Weapons to Terrorists” that appears in the current issue of International Security. In conjunction with this post, MIT Press will make the article freely available to all for the next 30 days; you can download it here. Nuclear terrorism is often described as the single biggest threat to U.S. national security. Analysts and policymakers worry that a hostile state could surreptitiously transfer a nuclear weapon or fissile material to a like-minded terror group, thus orchestrating a devastating attack on the United States or its allies while remaining anonymous and avoiding retaliation. This fear served as a key justification for the invasion of Iraq in 2003, and it helps drive current arguments in favor of a military strike against Iran’s nuclear program. We assessed the risk of nuclear attack-by-proxy by exploring the likelihood that a state could sponsor nuclear terrorism and remain anonymous. The question of attribution is crucial because a leader could only rationalize such an attack – and the decision to entrust terrorists with a vitally important mission – if doing so allowed the sponsor to plausibly avoid retaliation. If a leader did not care about retaliation, he would likely just conduct a nuclear strike directly – using missiles or special forces for targets beyond missile range. Giving nuclear weapons to terrorist only makes sense if there is a high likelihood of remaining anonymous after the attack. We undertook two approaches to assess the likelihood of attributing a nuclear terror attack. First, because there is no data on the aftermath of nuclear terrorist attacks, we use the ample data on conventional terrorism to explore post-attack attribution rates – focusing on high-casualty terror attacks. 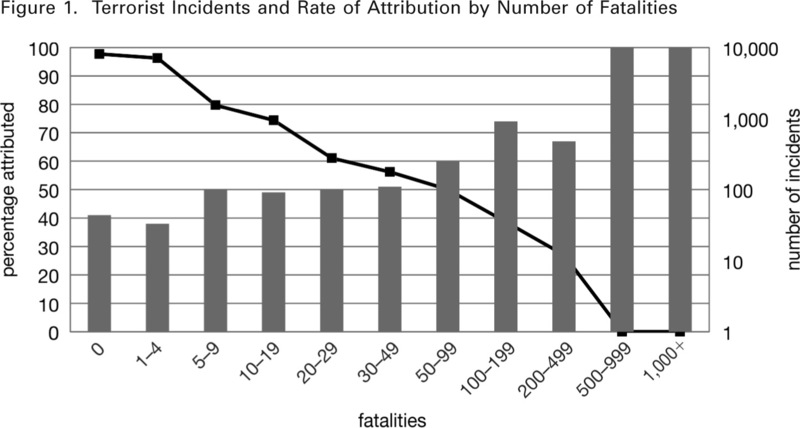 The data, as shown in Figures 1 and 2, reveal a strong positive relationship between the number of fatalities caused in a terror attack and the likelihood of attribution. Roughly three-quarters of the attacks that kill 100 people or more are traced back to the perpetrators. 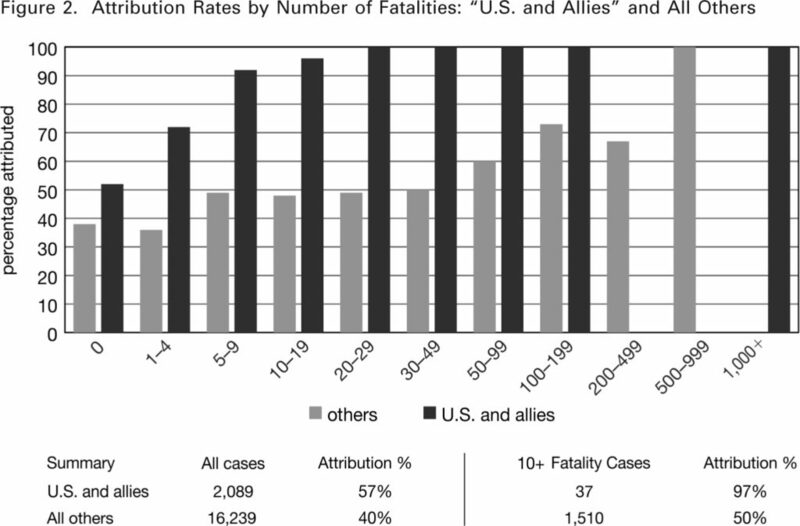 Moreover, attribution rates are far higher for attacks on the territory of the United States or a major U.S. ally – 97% (36 of 37) for incidents that killed 10 or more people. Second, we explore the challenge of tracing culpability from the guilty terror group back to its state sponsor. Leaders considering giving nukes to terrorists would have a strong incentive to select a group with whom they have a long, trusting relationship – in this case, members of the terror group would need to keep the source of the nuclear weapon a secret indefinitely – and one with a track record of successful operations and professionalism. But those two constraints greatly facilitate the task of tracing an attack from a guilty group to its sponsor. 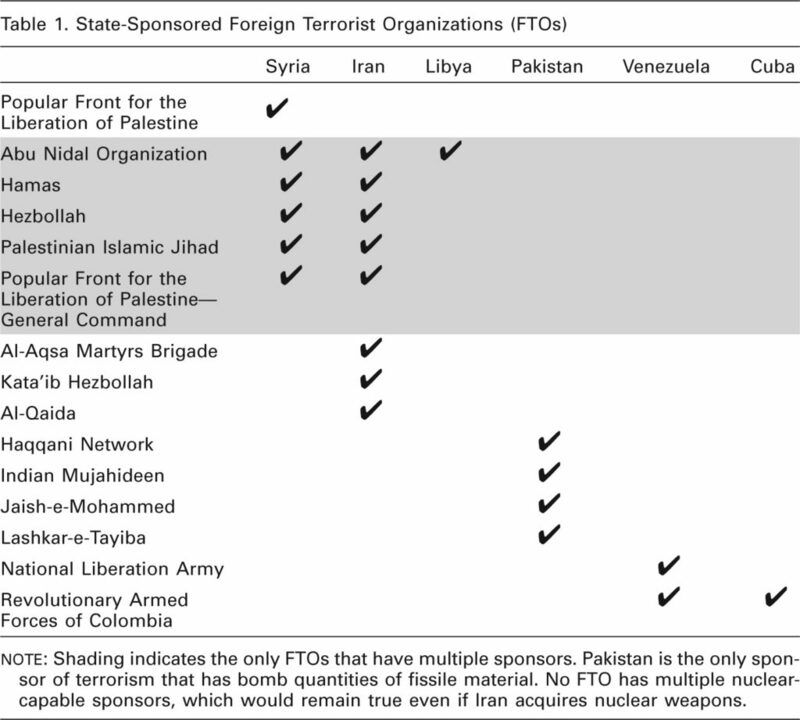 As Table 1 shows, there are few established terrorist groups who have state sponsors; each of them has few sponsors (typically one); and only one country that sponsors terrorism has nuclear weapons or enough fissile material to manufacture a weapon. Our overarching conclusion is that neither a terror group, nor a state sponsor, would remain anonymous after a nuclear terror attack. Attributing nuclear terror incidents would be far easier than is typically suggested; passing weapons to terrorists, therefore, does not offer countries an escape from the constraints of deterrence. If leaders understand these facts, they will be as reluctant to give weapons to terrorists as they are to use them directly; both actions would invite devastating retaliation. On table 1, I’m not sure I follow all the detail. Why is FARC not shaded as having two sponsors? Also, is it right to have a Iran down as a sponsor of Al Qaida? I had understood that the only support Iran gave Al Qaida was ad hoc refuge for some members, a service also provided, much more, liberally,by Pakistan. Finally, is it not the case that nuclear weapons tend to leave relatively clear forensic signatures which can be quite easily matched to information obtained fromscanning the aftermath of nuclear tests? This would seem to be more of a limiting factor than a circumstantial link made by identifying the terrorist organisation involved. After all, the reprisal actions taken by a power hit be nuclear terrrorism would likely be expensive and extremely destructive, which means the evidence required to launch them would have to bebetter than circumstantial. (1) The extent of the links between Iran and AQ are debated. I believe that in the IS article we base our judgment — to code Iran as a sponsor of AQ — on an article published by Dan Byman (and Byman argues that elsewhere, too.) I believe that Seth Jones also makes that same argument. It was a close call, therefore we figured it was better to code Iran as a state sponsor rather than the alternative, because by doing so we’re pushing *against* our argument. (2) On the shading: ooops. Mea culpa for the editing mistake. Yes, the last row on Table 1 should be shaded, too. (3) On post-detonation forensic signatures: one of the main subtexts of our IS paper is that the policy debate in Washington about nuclear attribution is too focused on those forensic signatures. Optimists about attribution often say we can do it (and they did it in the Tom Clancy movie!). Pessimists point out that isotopic attribution only works if we have a good, complete “library” of others’ fissile materials, and they point out holes in our current capabilities (and ask for more money to enhance them). A key argument in our paper is that this debate overly focuses on physical forensic attribution when that is but one arrow in the attribution quiver. Historically, attribution from SIGINT, HUMINT, and other intel and diplomatic sources have been very, very effective at attribution — especially in past cases that were destructive enough to generate a major investigative efforts, as a case of nuclear terror certainly would. Note that the US had firmly attributed 9/11 to AQ well before that organization had claimed credit; although the pre-9/11 evidence was scattered and ambiguous, the post-attack evidence was quite compelling — and only grew more so in the days and weeks after attack. Our bottom line: when terrorists do *really* bad things to powerful counties (e.g., the US and its close allies), we devote vast intelligence resources, play diplomatic hardball, and frequently do unspeakable (and unspoken) things to find out who did it — and we find out, in the overwhelming majority of the cases. Therefore, the notion that there are leaders out there who are sufficiently “deterrable” to reject using a nuke directly against us — but who are sufficiently bold to gamble that they can remain anonymous after sponsoring nuke terrorism — doesn’t make much sense given the very high attribution rates of high-casualty attacks. Or at least that’s what Keir and I conclude. Thanks for the questions and the catch on the Table. Daryl, thank you for the reply! Obviously I should have read the paper – which I have done -it was very good, and I would agree with most of the logic and the conclusions. I guess my outstanding question would be around your focus on states as the primary actors here. The discussion about Al Qaida and Pakistan seems relevant again – while the Pakistani state as such may not consciously have decided to sponsor Al Qaida and shelter bin Laden, a significant and capable component probably did so decide, and it is interesting that the US retribution against the Pakistani state as a whole for this has been limited. This suggests a possible ‘out’ for some states such as Pakistan and Iran which are known to have security forces which are rather disagreggated – launch an attack, and then when the link to (for example) Pakistan is inevitably made, in the way that you lay out, try and escape major retribution by blaming the attack on a small and expendable part of the apparatus. I’m not saying this is likely – there’s still the matter what the motivation would be for such an act, and the cost of such a move would still be high – at a minimum full and rigorously enforced removal of nuclear capability and probably partial or total demilitarisation. But I wonder how conceptually your argument can incorporate semi-independent actors like the ISI and Pasdaran? Thanks for the kind words, and I’m sorry I was slow in responding this time. I predict that such an advisor would be hung. This doesn’t mean that there are no dangers associated with proliferation. Perhaps some day, if the Iranian regime fell and there was chaos, a bomb could actually fall into a rogue military commander’s hands, but that’s not the “intentional transfer” danger we assessed in this paper. There are other dangers associated with proliferation, too. But it seems to us that finding a leader who is sane enough that he is deterred from launching a NW strike against a nuclear-armed enemy, yet crazy enough that he’d gamble his life, his country, his children, his Islamic Republic on the hope that his hated enemies will be merciful upon learning that his bombs were *possibly* stolen…that seems to require a very strange thought process. This may be another “you should have read the paper” sort of question, but how solid are the attributions of terrorist attacks? And how much of that comes down to admissions by the terrorist group? How else can we be sure who is responsible, if the terrorist group denies the attack? Is there usually solid evidence for the source, or is it more likely to be circumstantial evidence that suggests who’s responsible for a bombing, but doesn’t prove it?